When to drink and with whom? Often, when I’m tasting wine, this is what I’m thinking: When would be a good occasion to drink and with whom? Because isn’t this what wine is for? To drink with friends, family, and swoon-worthy lovers at everyday dinners, summer picnics, parties and soirees? Or sometimes, on your own, with a little music to soothe the soul? At last week’s annual spring tasting of British Columbia’s Okanagan Valley wineries on the Naramata Bench held in New Westminster, this is what naturally came to mind with hopes of spring around the corner. Why just the other day, it was warm enough to go sockless in Vancouver for a few brief hours in the afternoon. Naramata Bench is an 11-kilometre stretch of wine country that runs north from the town of Penticton along the eastern shore of Okanagan Lake to the rural hamlet of Naramata. 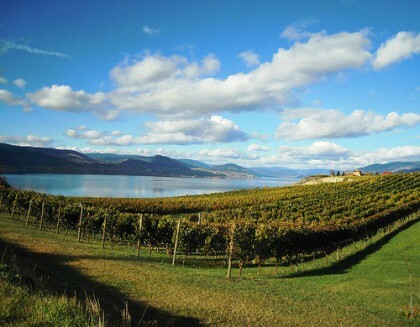 The Naramata Bench Wineries Association, which hosted the event, is a group of 21 member wineries. Here were the highlights for me with plans of spring and summer filled with wine, of course. The Pinot Gris was so nice that though I’ve been sadly spitting at these events, the wine just sailed smoothly down my palate before I could stop myself. The first sip brings flavours of sun-ripened peach and pineapple with hints of freshwater minerality on the finish. The 2011 Pinot Gris combines a voluptuous mid palate (yes, there is a burst of yum!) with a zippy backbone of acidity (read: refreshing) that builds a long and balanced finish (your mouth will feel like it’s had a taste of heaven). Wines from their second label Monster Vineyards were also being poured and I’m going to highlight their Monster Vineyards Monster Cab 2009 ($19.90). A blend of two-thirds Cabernet Franc and one-third Cabernet Sauvignon, it’s a nice way to introduce a person to Cabernet Franc, says Director of Sales & Marketing Laurie Barnes who was doing the pouring. Many will not be familiar with this grape variety in a wine of its own, as it’s more often part of a blend, adding fragrance and softness to Cabernet Sauvignon or Merlot. For me though, it’s the only grape variety as of yet that I just simply cannot wrap my tongue around. It has a certain leafiness that is just not appealing to me. Yet. Others champion the grape variety with much passion and spirit. There’s Sandra Oldfield, winemaker at Tinhorn Creek winery, also in BC’s Okanagan. There’s also world-renowned wine writer and author Jancis Robinson who writes that she has a “very soft spot indeed for its more charming and more aromatic relative, Cabernet Franc.” All I’ve gotten so far is that leafy characteristic. But I respect these two women of wine, so I want to learn more. The Monster Cab with its blend leaning heavily on the Cabernet Franc relative is just that. A soft, nice, and friendly red wine. Lake Breeze was another winery that was pouring multiple wines of note for me. The Lake Breeze Pinot Blanc ($17.90) would be good with seafood, I noted. Their Lake Breeze Pinot Gris ($17.90) smells like summer (outdoor picnics, patio lunches and dinners). The Lake Breeze Gewurztraminer ($17.90) is Off Dry with just a touch of sweetness and a lovely lychee nose. Definitely to try with Kung Pao Chicken. I’ve also put their Lake Breeze Seven Poplars Pinot Noir 2009 ($24.90) and Lake Breeze Meritage 2009 as evening reds on my list of To Drink. As with last year, Kettle Valley poured a variety of consistently great reds. I noted them all down with big check marks last year and this year I did the same, adding that the Kettle Valley Pinot Noir 2008 ($24.00) is a good buy, while the Kettle Valley Pinot Noir 2008 Reserve ($38.00) is richer. Which one’s better? Depends on what you’re having with, I say. There was the Kettle Valley Barber Cabernet Sauvignon 2007 Single Vineyard ($35.00) Check! Just a lovely, lovely red. While Kettle Valley Cabernet Merlot 2008 ($26.00) I’d noted for its buttery-ness. Kettle Valley Old Main Red 2008 Solid red. As for their whites, I noted the Kettle Valley Viognier 2010 ($26.00) had a beautiful aroma, and I imagine it with an Asian fusion dinner. I wasn’t able to taste all the reds that afternoon, so let’s get back to the whites, which I think are the area’s highlights anyway. Van Westen was the winery with check marks on all their whites. Van Westen Grigio 2010 ($18.90)=Nice. Sophisticated summer dinner. Their Van Westen Vivacious 2010 ($18.90) which is a Pinot Blanc with a splash of Pinot Gris=Even nicer. Van Westen Viognier ($24.90) Check! For summer patio parties, I noted Hillside Muscat Ottonel 2011 ($21.99). To pair with salads and grilled asparagus, I’m going with Therapy Sauvignon Blanc 2011. Their rosé Therapy Pink Freud 2011 is lovely too, made of a blend of merlot and pinot noir with a beautiful nose. Didn’t make it back in time to try the reds, as with this tasting, I’d decided to taste the whites before the reds, which I find easier on my tongue. I noted the Red Rooster Riesling 2011 and Township 7 Sauvignon Blanc 2010 had the characteristic Sauvignon Blanc herbaceous notes with good acid. Lastly, I noted that Perseus Viognier 2011 would be interesting to experiment with pairings. Interesting is what I write down when I’m not quite sure how the wine will play out. It’s a surprise to my expectations, which makes me curious to learn more. And it has been intensely interesting on this vinous journey, and frankly, frustrating as well over the past 15 months of marathon tasting, cooking and food and wine pairing experiments. Not in the wonderful opportunity to meet wine lovers, try so many wines, and eat so well, but in coming up with accurate (i.e. in line with wine school descriptions) but meaningful descriptions of wine. See that description above on the Township 7 Sauvignon Blanc 2010? It’s a good wine, and I noted a few things I’m being taught in wine school: characteristic herbaceous notes with good acid. Yet, the description is not at all evocative of the feeling you get when you take that first sip. There is no nuance, no expression, nothing that tells me, Oh! This will be perfect for tonight’s dinner or tomorrow’s lunch. It’s a neutral description, which I’m not so sure is the best way to describe wine. Not when there are so many out there, so many to choose from. Not when… well, so many things. But they are for future posts. A journey of a thousand miles begins with a single step, my father once told me. And so I enter this next phase of my culinary adventure with this first Tasting Notes post and a partial list of wines I’ve noted – inspired by upcoming events and meals, distracted by digressions, and sometimes, even using partial Systematic Approach to Tasting Wine notes. Hope you’ll bear with me as I muddle around with the language of wine.